Meet BFan's New 18-19 Season Company Dancers! Gabriel joined Canada's Ballet Jörgen in Toronto as a company dancer from 2012-2014, performing classical repertoire including Swan Lake, Romeo and Juliet, soloist roles in The Nutcracker, and many contemporary works under Director Bengt Jӧrgen. Gabriel's professional resume also includes work with Cia Independente de Florianópolis in Brazil, and guest performances across Canada and the US. 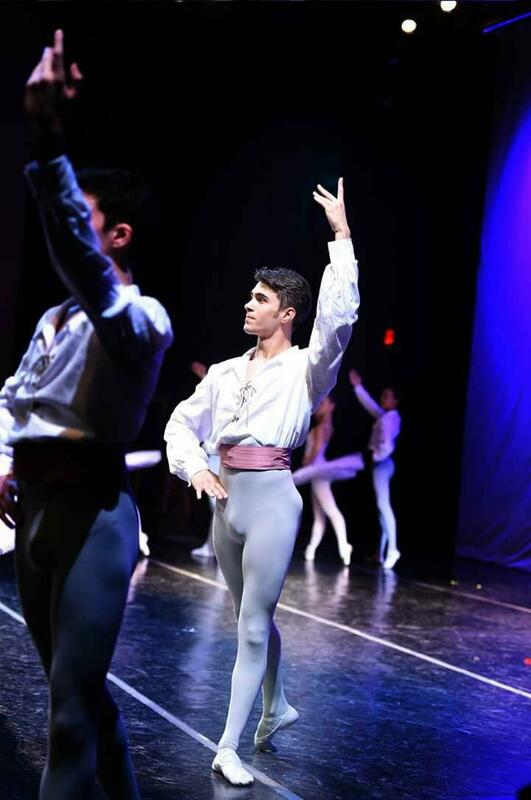 With Ballet Fantastique, Gabriel recently starred as the charming rake, Rafael Moncada, in Ballet Fantastique's ZORRO: The Ballet with the LA-based band Incendio and virtuoso violinist Brendan Vance playing the original music of Oregon composer Kim Angelis. Trying new foods, being adventurous, watching movies, learning new styles of dance, and spending time with her family! Esperanza began her training and danced professionally under the direction of Aida Villoch, former prima ballerina and Artistic Director of Ballet de Camaguey, Cuba. Growing up, Esperanza spent her summers at many prestigious ballet intensives, including Orlando Ballet, Milwaukee Ballet, San Francisco Ballet, and Oklahoma City Ballet. In 2015, Esperanza moved to Brussels, Belgium and worked with Menia Martinez, Director of Studio Maison Bejart. Under Ms. Martinez’s direction, she performed many choreography works from the late Maurice Bejart. In 2016, Esperanza moved back to the U.S. and performed under the direction of Ms. Villoch. She performed many soloist roles in ballets including Le Corsaire, Paquita, Nutcracker, Grand Pas Classique, and Swan Lake. Esperanza has also had the opportunity to work and perform as an apprentice with Dissonance Dance Theatre in Washington D.C. Under the direction of Shawn Short, she performed many of his choreography works including "Viewmaster, Time=No Man" and "Unsettled" by St. Louis choreographer Kameron N. Saunders. Aside from training and performing, Esperanza finds great pleasure and excitement teaching young and experienced artists her love and passion for the art. This is Esperanza's first season with Ballet Fantastique. Cody comes to Ballet Fantastique after working with Nevada Ballet Theater in Las Vegas last season. Originally from Philadelphia, Cody trained at Metropolitan Ballet, where he trained under Denis Gronostayskiy, Sergei Pupurov, Eva Szabo, and performed in world premiere choreography by both Kanji Segawa and Sarah Mettin. Cody was awarded full scholarship to the Bolshoi's Summer Intensive program in NYC, Cincinnati Ballet, Orlando Ballet and a full year scholarship to International Ballet Academy in North Carolina under Servy Gallardo. He has additionally performed in roles in The Nutcracker and Coppelia at South Jersey Ballet Theater, and multiple roles in The Nutcracker at Wilmington Ballet in the historic Dupont Theater. Kateri began her ballet training in Boise, ID at Capital City Ballet Center. At age 15, she was offered a scholarship to train at Ballet Idaho Academy, where she continued her ballet training until graduation. During her years in the Ballet Idaho Academy, Kateri performed frequently with their professional company in ballets such as Serenade, Swan Lake, Cinderella, Sleeping Beauty, and The Nutcracker. She then spent a year training with Ballet West's Academy in Salt Lake City, UT on scholarship. Her main mentors were Jeff Rogers, Heather Frixell, and Jan Fugit. She also spent five summers studying under scholarship at Ballet West. Kateri then returned to Ballet Idaho as an apprentice for their 15-16 season. Kateri has also performed as a company artist with Idaho Dance Theatre for their 16-17 season. There, she danced a variety of new and contemporary choreographic works by IDT director Marla Hansen and choreographer Sayoko Knode. Returning to her ballet roots, Kateri danced with Central West Ballet in their 17-18 season as a company artist, where she performed many soloist roles. Among her favorite roles were Jewell Doll and Chinese lead in The Nutcracker, and the Spring Fairy in Rene Daveluy’s Cinderella. Kateri is also pursuing her Bachelor of Science degree, majoring in the field of biology at Boise State University. She is excited to join Ballet Fantastique for the 18-19 season. Madeline was born in Milwaukee, Wisconsin, raised in Madison, Wisconsin and has been dancing for over 15 years. She began training at the School of Madison Ballet under artistic director W. Earle Smith. Madeline begins her first season with Ballet Fantastique from Butler University’s nationally-recognized dance program. Madeline received a scholarship to the Pittsburgh Ballet Theatre School, where she attended intensives during three summers. She also attended summer intensives at other prestigious ballet schools around the country such as Ballet Chicago and the Kirov Academy of Ballet. While at the School of Madison Ballet, Madeline was asked to join the pre-professional program for the 13-14 and 14-15 seasons. During these two seasons, she performed in many ballets including The Nutcracker and Cinderella, as well as W. Earle Smith’s critically-acclaimed, neoclassical works of Groovy, Expressions, Dracula, and La Luce D’Amore. As part of this program, Madeline additionally toured throughout the state of Wisconsin with Madison Ballet performing various repertory works. Madeline performed many corps roles in works such as George Balanchine’s Elegie and The Four Temperaments at Madison Ballet and Butler University, respectively. At Butler, Madeline performed corps roles in ballets including The Nutcracker, Swan Lake, Giselle, Cinderella and various works in the annual Midwinter Dance Festival. In 2017, she performed her debut soloist role of the “Arabian Queen” for the Indianapolis community in Butler University’s production of The Nutcracker. Madeline spent the past few years at Butler University on academic scholarship studying dance, arts administration and strategic communication. She hopes to pursue her education throughout her dance career and complete her bachelor’s degree. Not only is Madeline motivated by expressing herself onstage, but she is also fascinated by how dance can have such a positive impact on people of all ages and enjoys performing as a way to empower herself as well as the audience.